Fasten your seatbelt and enjoy the ride! 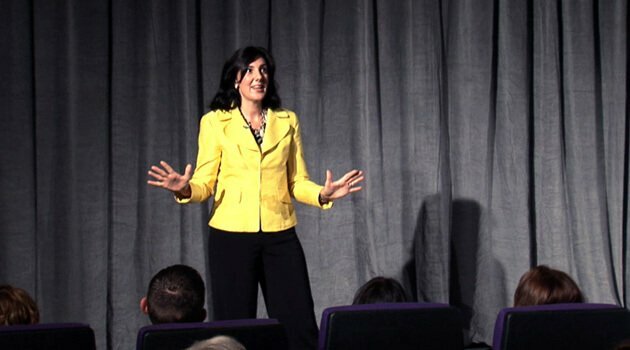 Christine Cashen delivers a fast-paced, hilarious program with useful content that makes her a sought after speaker worldwide. For more than 14 years, she has jazzed an amazing variety of audiences throughout the United States, Canada, South Africa and Australia. Christine is an authority on sparking innovative ideas, handling conflict, reducing stress and energizing employees..
What makes her unique is the "fun" factor. Whether talking about her "hottie engineer" husband, her pet peeves or growing up in an Italian/Irish household, audiences always relate to her experiences, struggles and lessons. She combines a down-to-earth attitude with a colorful artistic streak. Comments such as "I feel like I've known her forever," "we must take her back to our workplace" and "it felt as if Christine was speaking directly to me," are a testament to her effectiveness and style..
Christine has been featured as a creativity expert in HOW Designs at Work magazine and is co-author of the book Mission Possible, Volume Eight. She has also developed the A Dynamic Speaker series of learning resources: Get What You Want With What You've Got DVD, Why Can't Everybody Just Get Along CD and Got Humor Video. Her new book, The Good Stuff, really is good stuff! Christine resides in Dallas with her husband, their two children and Murphy, the chocolate lab.